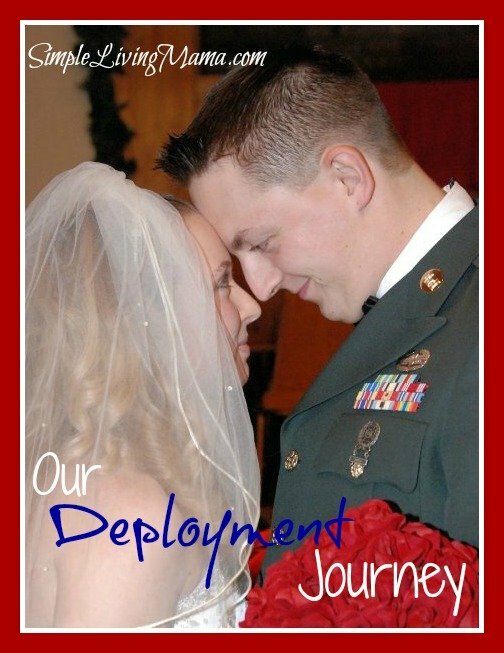 The love of my life, the father of my children, finally returned from a 10 month deployment to Afghanistan on October 9, 2013. Our soldier’s homecoming was one of the happiest days we have had! I want to tell you how it went down from the very beginning. Originally, the entire company was supposed to fly in to our home state together and we were all to gather at a large location for a homecoming ceremony. Well, the government shutdown prevented a homecoming ceremony. There was no one working to schedule a charter flight, so all the soldiers had to fly in on individual commercial flights. That meant everyone would arrive at different times. So, instead of a big welcome home ceremony, we got to greet our soldiers at the airport and immediately bring them home. Luke’s flight was scheduled to arrive at 11:10 a.m. I was so happy that we were going to be able to get him in the morning. I got the kids up, fixed them breakfast and immediately went about cleaning the house. I was actually cleaning my kitchen floor with a rag! You have to remember Luke had not seen our house in person yet, so I wanted everything to be as perfect as possible. The next order of business was to dress myself. Getting dressed wasn’t the hard part, but by the time I got around to doing my make-up, Baby O was fussy. I let him fuss and finished my face. 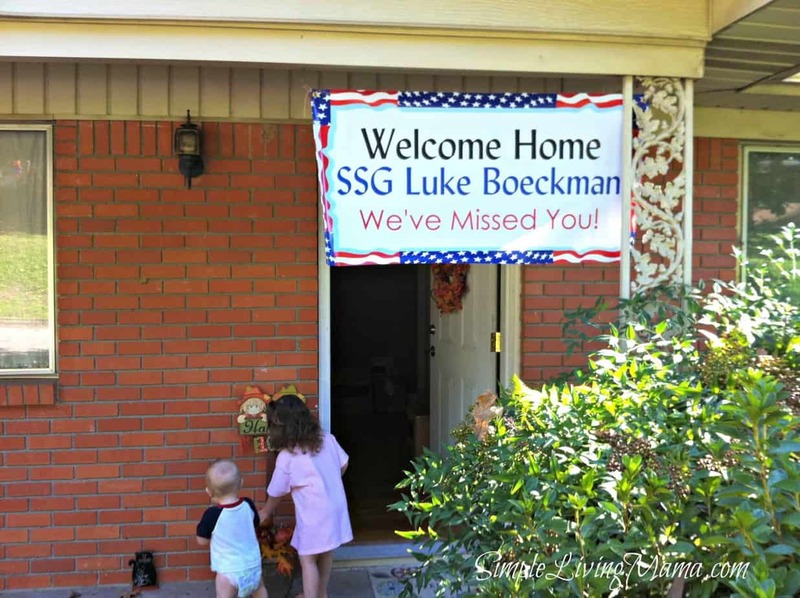 Then I hung Luke’s welcome home sign on our porch. 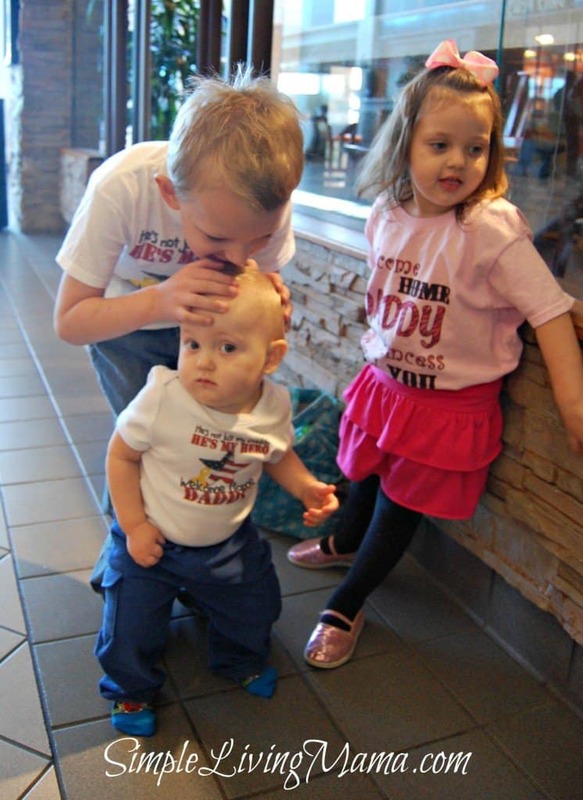 My next mission was to dress the kids. They were running around, jumping off the walls, and excited, but I managed to get them dressed and have them avoid food so they wouldn’t stain their welcome home shirts. Then I finished my hair and threw on a pair of 5 inch high heels. I really contemplated wearing the heels. I mean, they aren’t appropriate toddler chasing shoes, but I love wearing heels and I wanted to look good! At this point it was time to go. 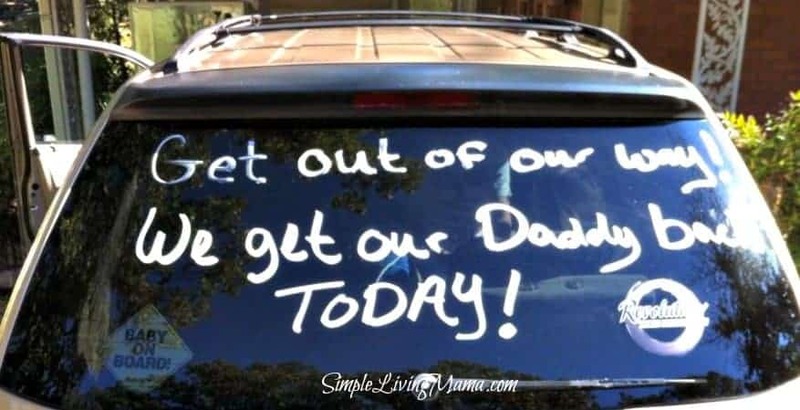 I loaded the kids in the car seats and quickly wrote our welcome home messages on the van windows. We sped off to the airport. I half remembered where I was going, so that was good. I had three kids ages 4 and under with me. I was wearing extremely high heels and praying I wouldn’t fall. I was carrying a baby and a diaper bag. I was alone. My mother-in-law was meeting me at the airport and she wasn’t there yet. Everything went fine until we got to the escalator. I was holding Baby O and the other two were right behind me. I don’t know exactly what happened. Obviously we couldn’t all fit on the same step of the escalator. Bug stepped on with me. I yelled for Sis to step on, but she didn’t. Darn, I should have grabbed her. I yelled for her to step on again since we were leaving her behind. She did, but then she decided to try to climb the steps to get to us. Her shoe came off. Oh, no. I yelled for her to stay put. We stepped off the escalator and I held my breath waiting for my daughter to come up. She did, and I yanked her off. Then I stood there waiting for the shoe to come up. There I was, baby in one hand, diaper bag on my shoulder, mile-high heels, bent down waiting for a pink, sparkly shoe. It came up and I snagged it! I gracefully stood up and pretended nothing just happened as I walked my brood over to the waiting area. By this point the kids were bustling with excitement. Bug was jumping up and down asking every five seconds if Daddy was there yet. Sis was playing with the other kids, and Baby O was toddling all around the place. I was so excited, but nervous. My stomach was doing flips. I couldn’t wait to see my man’s face again. My mother-in-law arrived about five minutes before soldiers began exiting into the lobby area where we were waiting. Each uniformed man I saw made my heart jump a little. A part of me figured he would be the last one off the plane. And this is getting pretty long, so come back tomorrow to read Part 2 of our soldier’s homecoming and see how everyone reacted to the return of Daddy!